When you want to make your own pasta using a pasta machine, you will find all kinds of recipes. According to what type of pasta you desire and if you wish to create a healthier pasta than what is found in stores, then you are going to truly enjoy this recipe along with variations afterward to help you make different colored pasta as well as add even more nutritional value to your homemade pasta with a machine. The recipe itself should only take twenty-five minutes to prepare except for the variations which will add more time. In most cases, you will cook the pasta for five minutes, but of course, you should cook it until you achieve the tenderness you desire. The recipe below will serve four to six individuals and is easy to make. You will need either two cups of unbleached or whole wheat flour, three organic eggs, ½ teaspoon of sea salt, and ½ cup of virgin olive oil or another type of organic oil. Pour the two cups of flour on your work area. Create a hole in the center of the mound which will create a well. Make sure the sides are steep. Add the eggs into the hole, along with the oil, and sea salt. Slowly mix those ingredients using a fork. As you begin blending in the flour pull a small amount at a time into the hole. Your dough will start taking shape as you pull in more of the flour. Keep up the work until you have pasta dough. If the dough is sticky wet you should add a bit more flour, if too dry just add a bit of water until you have the right consistency, no matter which problem you may have. Once the dough is the right consistency, start kneading your pasta dough. Keep kneading for around ten minutes and then cover the dough with plastic and allow resting for at least fifteen minutes. 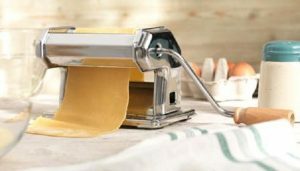 If you are not ready to use the pasta dough for your homemade pasta with a machine, you can place it in the refrigerator. It will be good for twenty-four hours but before rolling you will need to allow it to become room temperature. When you are ready to use the dough divide into four sections. Always keep the ones you are not working with covered in plastic. 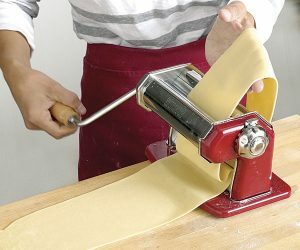 Now, you can roll out the pasta dough unless you the best pasta maker and you would not have even had to make the dough. 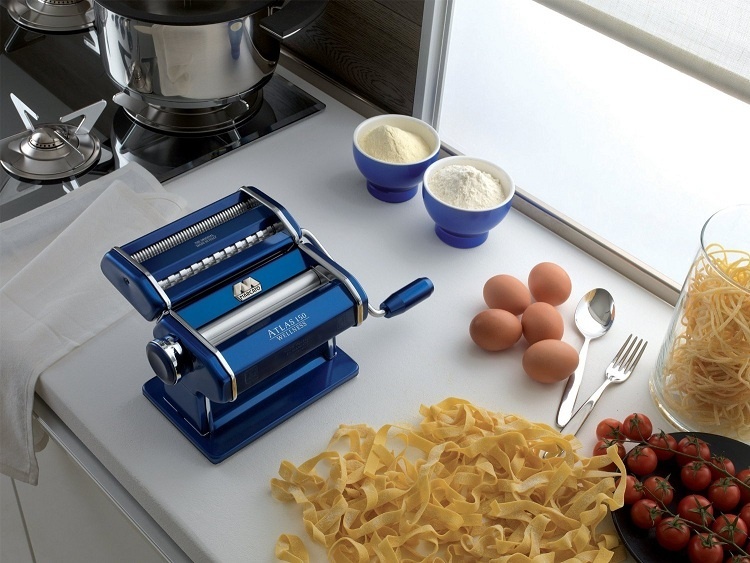 The best pasta makers come with a mixing and rolling attachment so you do not have to do all the hard work yourself. 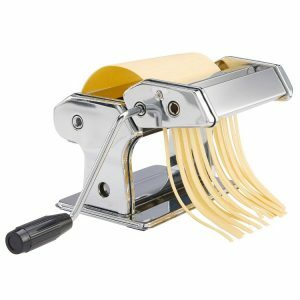 Make sure you know how to use the pasta machine properly before you get started as you want to ensure that you add the disc correctly for making pasta that you want. 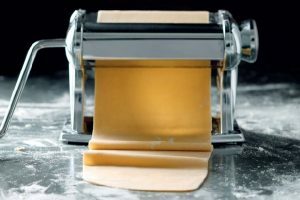 If you are using a pasta machine that does have a roller, you will still need to roll out your pasta dough in an oval disc shape. Add a bit of your flour to the roller, your hands, and the disc. There are all kinds of disc attachments according to the automatic pasta machine you have purchased. You should be able to place the disc onto the commercial pasta making machine you desire such as for angel hair pasta or lasagna. Then all you have to do is place the pasta dough into the industrial pasta machine and it will create the type of pasta via an automatic pasta machine. The machine itself will push the dough through and then you will need to hang the pasta to dry on a pasta rack. 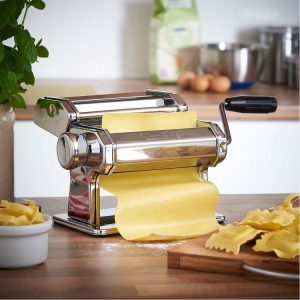 If you are not using an automatic or one of the best electric pasta makers and you are using one that is manual, you will have to feed the dough to flatten and cut into the shape of pasta you desire. Remember when you are looking to buy the best pasta maker, you should pay close attention to pasta maker reviews of other consumers that have purchased one such as the Kitchenaid pasta maker. You will be able to learn more about the features, durability, ease of use, and if it is easy to clean or not. If you purchase without reading specifications and attachments that go with the pasta maker you have chosen you may not be able to make the type of pasta you desire as it does not have the right attachments. For those that desire a bit more nutrition or want their pasta to have a bit of color, you can use various vegetables to help create your own pasta maker recipes. If you do add more liquid to the dough it should be added to the eggs and you will need to remember to also add more flour in order to get the right consistency. If you want your pasta to have a bit of an orange color put in two and a half tablespoons of tomato paste into the hole before you begin mixing blending the flour into the hole and blend with the liquid mixture. If you desire your pasta to have a kind of red tint you can use one large beet for creating this color. You will first need to preheat your oven to 400 degrees Fahrenheit. Cover the large beet in foil and bake forty-five minutes. If not tender, bake a few more minutes. Once it is tender, use a food processor and puree the beet. You should place around four tablespoons of the puree into the mixture that you have in the hole in the flour. Herbs are great to add when making pasta with a pasta machine. Just use any fresh minced herbs you desire. The one-half cup will be enough to create speckled fresh pasta recipe for a pasta machine. You also add the herbs to the egg mixture before you begin blending the flour.